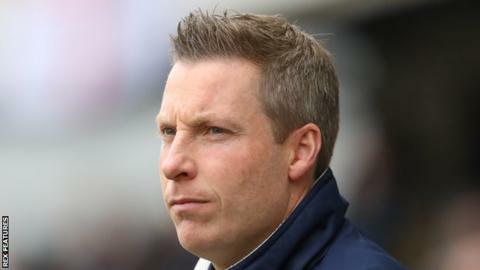 Millwall boss Neil Harris believes promotion from League One is "more important" than FA Cup success. The Lions claimed a third Premier League cup scalp this season by beating Leicester City 1-0 at The Den to reach the quarter-finals. Millwall will play Tottenham at White Hart Lane in the next round, but Harris' focus remains on the league. "We're at home to Chesterfield on Tuesday night - and if anything that has become more important," he said. Millwall are on a 10-match unbeaten run in League One and are seventh in the table, outside the play-off positions on goal difference only, with a game in hand. The south London club will move into the top six if their result against Chesterfield betters that of Southend away at Peterborough. Harris' side finished fourth last season, before losing to Barnsley in the play-off final at Wembley, and the former Lions player is hoping to go one better this season. The 38-year-old told BBC Radio London: "My achievement this year is promotion - that's what I want to be judged on. "We want to get out of this division. We started the season looking to consolidate a play-off position. "We overachieved last year with spirit and determination. We had a slow start this year, but we've got ourselves into a good position."